Outreach Manager is a tool used by athena’s operations team or practice front desk schedulers to help patients close care gaps. A common of patient outreach is getting a call to schedule your annual wellness exam. A person from your doctor’s office might call you to tell let you know it’s time come in, you schedule your appointment, go for your visit and that’s that. But multiply that by 100s of patients and 15 different care gaps. That’s too many rounds of phone tag for an already busy scheduler to play. To make this process efficient and scalable, Outreach Manager identifies which patients need to come in for what care gaps and contacts them on behalf of the practice via email, SMS, or automate phone call. The patient then schedules an appointment or gets more information about the preventative measure. Internal users made getting feedback easier. Through surveys, parsing through forms, usability sessions, and tracking performance we gained insight into many unaccounted complexities from our original workflow. I even convinced the whole scrum team to take a trip up to see our Operations team using our tool in Belfast, Maine which was an excellent empathy building experience for the team. These insights influenced the roadmap. This is still too much manual work. Looking through the notes Operations users were recording on their calls with patients a few things became apparently quickly. Patients want to take care of more than one care gap at a time. Why not take care of that flu shot at the Annual Wellness Exam? It’s not as simple as scheduling an appointment. Care gaps for Colon Cancer can be satisfied a few different ways. If a patient doesn’t want to get a colonoscopy, the person on the phone can offer them a ColoGuard test instead. Everyone doesn’t respond on the first try. Does this mean we need to make a new campaign to get everyone in? And doesn’t this require monitoring which patients responded and which ones didn’t? Everything goes in the notes field. Outreach managers were documenting all of this additional work in a notes field that was impossible to use for insights in a way structured data could provide. Outreach Campaigns 2.0 featured on-going multi-gap campaigns with multiple actions a patient could take to become satisfied for a measure. This required thinking through all these workflows. Ultimately, this influenced the way the back-end was laid out as well. to avoid creating new campaigns every month. 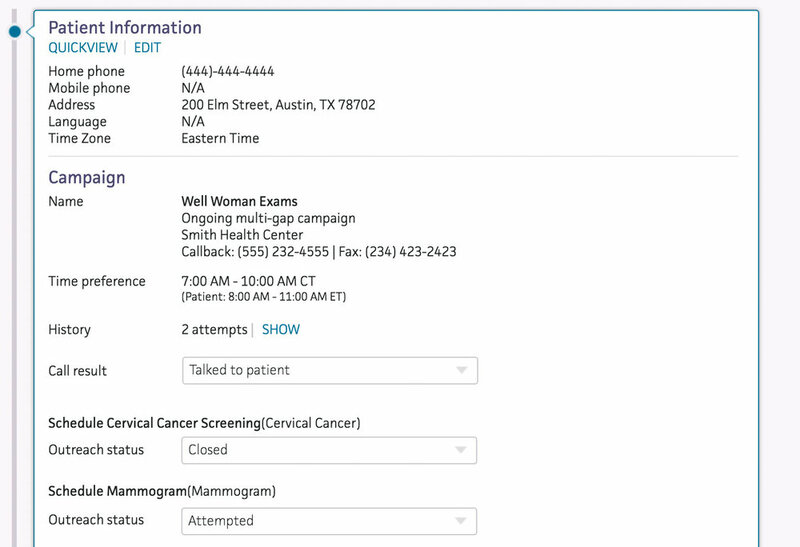 Listing the multiple care gaps drove operations users to address and record in one phone call. I worked with the Performance Analytics team to track how campaigns were doing and which pieces of content resonated with patients. This required tying data together that ranged from open and click rates to how many patients attended appointments they scheduled. Marketing Automation used these metrics to craft future content. North Central Medical? Must be spam. If a patient receives an email from a Hospital System instead of their Primary Care Physician they’re less likely to open, respond, or schedule an appointment based on data from Performance Analytics. I worked with the Marketing Automation team to manage provider, department, practice, and medical system level branding from all communication. For some campaigns it made sense to receive messaging directly from a physician whereas for others, it made more sense to have your local department invite you to come in. These are decisions the tool could default, but customizations that had to be supported.